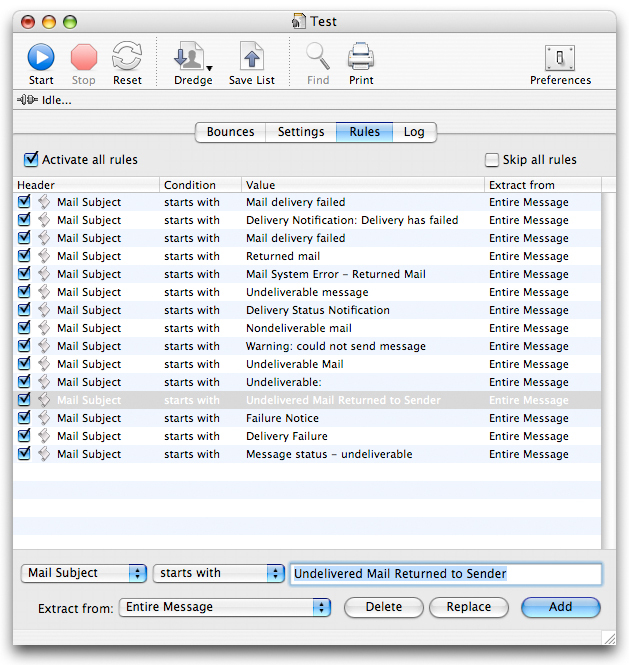 eMail Bounce Handler is able to process Delivery Status Notification, also known as DSN. It is a standard bounce format intended to provide detailed information about a delivery error. This format is widely used because it contains valuable information like for example the reason why a message could not be delivered successfully. That includes a standard error code, a description and the addresses that cause the error. The Delivery Status Notification specification is explained in RFC-3464. eMail Bounce Handler includes an advanced parser that is able to extract all the valuable information from the notification and convert the error code into something human readable following error definitions contained in RFC-3463. Note that 10 out of 9 bounces currently use that format. For the bounce messages that are not formatted following the DSN standard eMail Bounce Handler lookup the Enhanced Mail System Status Code when available. This code allows the application to find out if the bounce is a hard or a soft bounce (Fatal Error or Warning) and to get an explanation of the error that caused it. The list of error codes is available in RFC-3463. In case the bounce is not a DSN and doesn't even contain an error code eMail Bounce Handler will then extract the server response and will lookup that response using a set of 60 error tracking and regex based rules. This set was created after processing dozens of thousands bounces in the last years. As a result eMail Bounce Handler is able to catch up to 99,9% bounces successfully. All that processing is not done on every single message but only on the messages that match at least one of the rules listed in the rule editor. 14 rules are automatically added to that editor at startup. You can easily add new ones, modify or delete them. This default set of rules cover 99% of bounce types. All internet e-mails are made of 2 parts called Header (or Headers) and Body. Header contain sender and recipient addresses along with special information. Body part contains the message contents themselves. eMail Bounce Handler allows you to use either parts both for the rule and extraction. Each rule takes a given message header from Subject, Sender, Body and Recipient, looks if it contains, is equal to, starts with or ends with a given text and finally extract e-mail addresses from the Entire Message, From or To header, all Headers or Message Body. An incoming message will be treated as soon as at least one rule is met. All remaining rules will be discarded. All rules can be activated/deactivated individually using their associated check boxes. All rules can be activated/deactivated at once clicking on the Activate all rules check box. You can force eMail Bounce Handler to process every incoming mails clicking on the Skip all rules check box. Note that current rules will catch almost all possible bounce types looking at the message subject. It is actually the best way to detect a bounce.